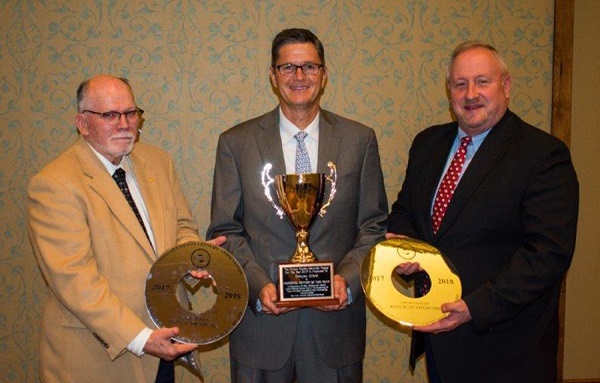 Dwayne Alford (center), the 2017 Horace Hayden National Cotton Ginner of the Year, and co-recipients of NCGA’s 2017-18 Charles C. Owen Distinguished Service Award – Dale Thompson (left) and Ross Rutherford (right). Dwayne Alford, former manager and vice president of YUCO Gin, and who provided several years of dedicated service to the U.S. cotton industry, was honored as 2017 Horace Hayden National Cotton Ginner of the Year by the National Cotton Ginners Association (NCGA). The organization also honored Ross Rutherford of Lummus Corporation and Dale Thompson of the National Cotton Council as co-recipients of the NCGA’s 2017-18 Charles C. Owen Distinguished Service Award. The awards were presented during NCGA’s 2018 annual meeting in Fort Worth, TX. The National Cotton Ginner of the Year award honors a ginner in recognition of able, efficient and faithful service to the ginning industry and continuing the principles exemplified and practiced by Horace Hayden, a former NCGA executive secretary. A native of Arizona, Alford earned a B.S. in Business Administration from the University of Arizona before beginning his agriculture career in 1991. Since joining YUCO Gin in 2003, he has made several cost-cutting improvements to that operation. Over the past 14 years, his professionalism and integrity helped advance the ginning industry. A graduate of the National Cotton Council’s (NCC) 2007 Cotton Leadership Program, he served as a NCC ginner delegate, as a NCC director and chaired multiple NCC committees, including the Research and Education Program Committee and the Joint Cotton Industry Bale Packaging Committee. A former president of the Arizona Cotton Ginners Association, he also served as NCGA’s president in 2014 and chaired several of its committees and subcommittees. The Charles C. Owen Distinguished Service Award honors those who have provided a career of distinguished service to the U.S. ginning industry. Rutherford, a Texas native, went to work for Lummus Industries as a field engineer in Lubbock, TX, after earning his B.S. in Agricultural Engineering from Texas A&M University in 1983. After working in various positions with the company, including in Fresno, CA, and in Columbus, GA, Rutherford returned to Lubbock where he currently serves as product general manager. In that position, he oversees the gin machinery product line regarding size and scope of product offerings, including product features and options and costing/pricing for sales. A long-time member of the American Society of Agricultural Engineers, Rutherford also teaches classes at the NCGA’s three annual ginner schools, and provides technical support and instruction for the schools’ continuing education level classes. Thompson, who was raised on a cotton farm near Bula, TX, earned a degree in mechanized agriculture at Texas Tech University. 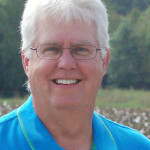 After farming and custom cotton harvesting for several years, he joined the NCC as a Texas field representative in 1984. In 2001, he became the manager of Marketing and Processing Technology in the NCC’s Technical Services Department in Memphis. In that role, he has provided staffing for the NCC’s Joint Cotton Industry Bale Packaging Committee, its Cotton Flow Committee and its Packaging and Distribution Committee. Thompson also has helped coordinate the NCC’s seed cotton and lint contamination prevention efforts. Harrison Ashley of Cordova, TN, serves as NCGA’s executive vice president.